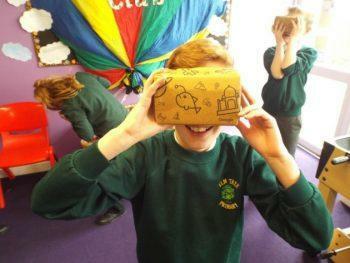 Youngsters at Elm Tree Primary Academy took virtual reality expeditions to locations such as the Great Barrier Reef, the Amazon Rainforest as well as inside the human body thanks to a special selection of activities held at the school. 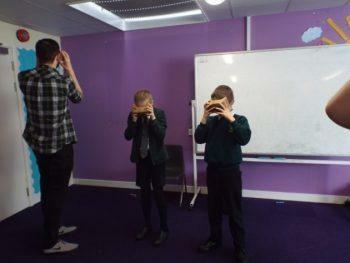 Taking place on March 22, this unique educational opportunity came courtesy of representatives from internet giant, Google, who demonstrated to pupils the capabilities of Google Cardboard. Google Cardboard is a virtual reality headset designed by Google for use with a Smartphone. And by using two free apps – Google Cardboard and Google Expeditions – users can be transported on virtual reality journeys around the world, solar system and inside human body to understand and view the workings of the world. Jade Hutchinson, a Year Four class teacher at the school, said: “The day was fantastic! All of the children were excited and engaged. It was a good way to reinforce some children’s learning. The visit followed a successful application by the school for Google to come to Elm Tree Primary Academy and demonstrate how the apps and head sets work and how they can enhance learning. 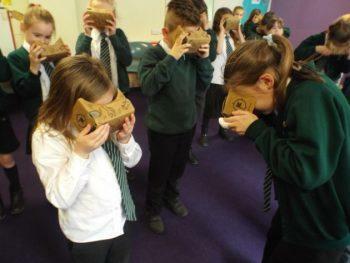 During the day pupils aged between five and 11-years-old all participated in a range of exciting virtual reality journeys. Ms Hutchinson, added: “The aim of the day was to see how the cardboard could be brought into the classroom to encourage and further learning.